I wandered into Lucia’s To Go a few Sundays ago, on my way to the Uptown Market. I don’t get to Uptown very often, so I will take (or make up) any excuse I can to visit one of my favorite Minneapolis spots. 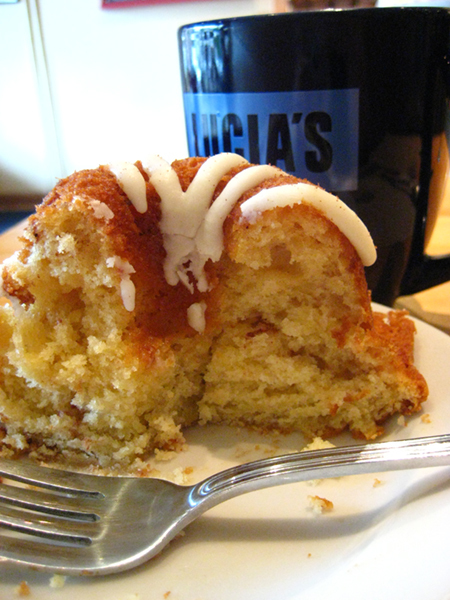 "not too sweet, just sweet enough -- which is a good thing..."At Lucia's, I usually would go for a bakery item like a popover, biscuit, or cannelle to go with my coffee, since these are pretty distinctive pastries that I haven’t been able to find at many other places in Minneapolis. However, I was feeling indecisive that day, and gladly took the recommendation of the nice girl behind the counter, who said, “Try the Budapest bundt cake. You will not be sorry.” Or something like that. The point is this: I was NOT sorry. That was one delightful, little treat. It was not too sweet, just sweet enough — which was a good thing, since it was a fairly large cake (it could easily be shared). The crumb* was perfect — moist and delicate, but with plenty of structure. And the lacy icing on top was just the right complement to the hint of spice in the cake. In a word, it was divine. And it went perfectly with the coffee, which is important. It was exactly the mid-Sunday afternoon sustenance I was looking for. The Uptown Market will be back in action this Sunday, from 11 to 5. So if you are out and about, stop by! Maybe after a little taste of heaven? Hmmmmm? *Keep in mind that when I use a term like “crumb,” I am not pretending to channel public radio’s Lynn Rosetto-Kasper. I am harking back to my early days of domestic nerdery as a 4-H cooking student, where I first learned the term, and what it means. By the way, it’s pretty much what you think: the way the inside of a baked good looks and feels, or its texture.